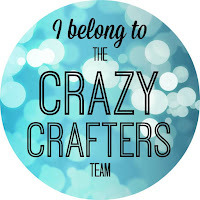 Welcome to the Crazy Crafters blog hop for July. You may just be starting the blog hop here at my blog or may have come from the person before me in the list below. If you get off track at any time, the full line-up below will help you move along from blog to blog so you see all the projects. At the moment you are visiting Stephanie Fischer, The Crafty Thinker. This month we are excited to show off our favourite Stampin’ Up! colour combinations. We hope you find great inspiration from the projects. I have a confession - I don't really have a favourite colour combination ..... I just love colour! One of the most attractive things about Stampin' Up! is that colours are carried through from ink to cardstock, patterned DSP, ribbons and embellishments. So it's really easy to play with colours and combinations, which is one of my favourite occupations! Sometimes I draw colour inspiration from a DSP (patterned paper) and sometimes I just pick up bits of cardstock and play with them. That's what I did this time. I really like the top four colours in combination - they give a lovely soft colour scheme. But I wasn't really in a soft, muted mood and wanted a bright and focussed splash which the Tangelo Twist provided. Leaves from Awesomely Artistic & Butterfly Basics. Flower inspired by Miriam Spiess. The leaves (from Awesomely Artistic & Butterfly Basics) are stamped in Elegant Eggplant onto Tip Top Taupe cardstock then fussy cut. The flower is made from Tangelo Twist (see Miriam Spiess' tutorial here). The centre is filled with a little bit of white 3-D Puff paint sprinkled with Dazzling Diamonds glitter. I could have used one of those beautiful Metal Rimmed Pearls but I was experimenting! The base card is Lost Lagoon with layers of Perfect Plum, Tip Top Taupe and Lost Lagoon. Each of those layers is stuck to a layer of Elegant Eggplant cardstock that is just 1/16" larger to give a very fine edge of the darker colour. The top layer of Lost Lagoon was clear heat embossed. To do this, I placed one of the stencils from Happy Patterns over the cardstock and patted my Versamark pad over it until I was satisfied with the coverage. Then I removed the stencil, sprinkled on the clear embossing powder and heated it with the heat gun. I placed a Rhinestone Jewel in each of the little circles. There's a little bit of Tangelo Twist ribbon (now retired I'm sorry to say) to finish it all off. I hope you've enjoyed this project, I would really welcome your comments. Oh wow! I love this card. Just gorgeous. Wow very interesting colours!! Really stunning card. 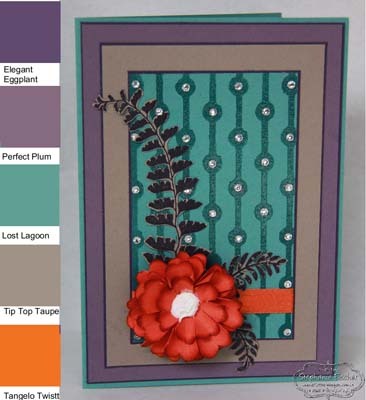 LOVE your card Stephanie .. the background is an interesting feature and the colour combo is just gorgeous ! Thank you, I really appreciate your comments. I was quite surprised to find myself adding the Tangelo Twist but I'm glad I did! This is a beautiful card! I love your flower!! I love the flower. The addition of Tangelo Twist makes your card pop.